An unfortunate side-effect of the infighting in Congress is a government shutdown. These shutdowns have far-reaching effects that the average person might not expect until they experience these effects for themselves. A question that we hear whenever a government shutdown occurs or is discussed is: will the government shutdown affect my VA benefits? That’s a complicated question, and we’ll do our best to answer it. Read on to learn if your benefits are affected by a shutdown. And if you need help getting access to the VA benefits you need, like the VA Aid and Assistance Pension, reach out to Patriot Angels today for help! Government shutdowns have occurred frequently throughout the last several decades. Some shutdowns have lasted for a few hours and had minimal impact on the functioning of the government. Others have lasted several days, or a few weeks, and have curtailed the government’s ability to provide the services they promise. Veterans’ VA benefits can be hampered by a government shutdown, but only in extenuating circumstances. 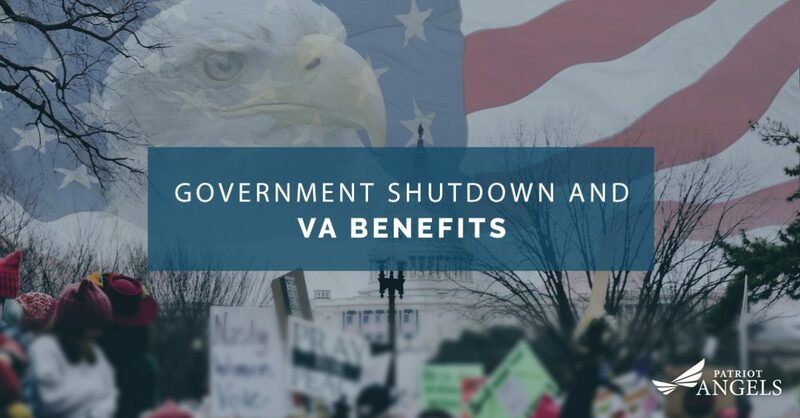 In most brief shutdowns, VA benefits are under no risk of being delayed or hindered. For instance, in the 2013 shutdown, there were fears that VA disability checks would not be distributed due to the length of the shutdown. For the most part, however, VA benefits like disability, retiree pay, and survivors’ benefits are funded through separate sources of money, so checks should continue to be distributed. That does not mean that all VA benefits are immune from the effects of a shutdown. In the tragic event that an active duty military service member is killed in action during a shutdown, the family of the deceased would not receive their bereavement benefit. The family would not be able to collect the $100,000 benefit that helps to cover funeral costs. Medical care on military bases can also be affected by a government shutdown. While emergency, inpatient, and acute care will continue to be provided at these hospitals, other procedures would not be. Elective procedures and primary-care appointments would be canceled. In the event of a government shutdown, it is important to contact your clinic or hospital to see how it could impact your care schedule. For the most part, in the event of a government shutdown, VA benefits are secure and not impacted. This is thanks to the Department of Veterans Affairs successfully lobbying Congress to fund the VA on a two-year budget cycle. In effect, this makes the department exempt from government shutdowns. So when the news portends another government shutdown, rest easy knowing that your VA benefits are secure. However, if you’re losing sleep over the quality of care you or your veteran is receiving, contact Patriot Angels today. Our team specializes in helping you apply for the VA Aid and Assistance Pension that can help offset the costs of a long-term and assisted care for your loved ones.